ExpertLotto.com • View topic - Number distributions? 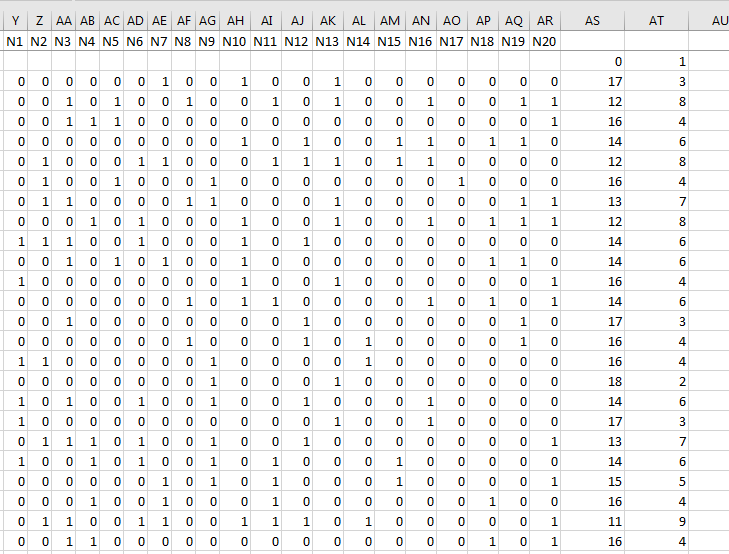 This table shows how many numbers are drawn from the last draw, on every draw, for Poland 20/80 multi. As you can see the first row shows 00001000100010000 ---> Which means it has 17 numbers which are unique and not been drawn before in the last ONE draw. Just 3 numbers were already drawn before, just once (impossible to be more than once since you take only last ONE draw). 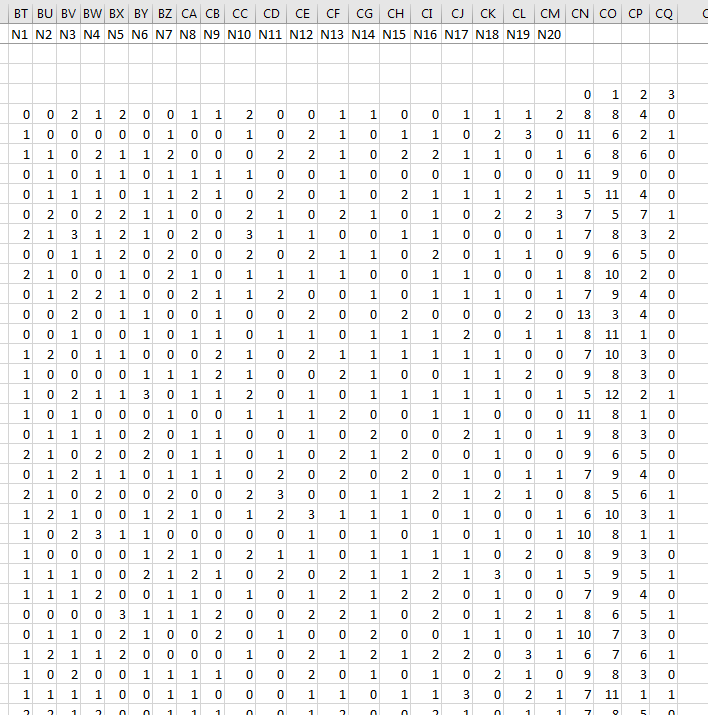 Columns 0 and 1 shows what I already said 17 numbers zero times, 3 numbers 1 time. This table shows how many times numbers were drawn in the last 3 draw before. For this one you can see on the column 0-1-2-3 the numbers: 8, 8, 4 and 0. This means that in this draw 8 numbers were drawn zero times before in the last 3 draws. 8 numbers were drawn just 1 time in the last 3 draws. 4 numbers were drawn 2 times in the last 3 draws and 0 numbers (none) were repeating on every draw in the last 3 draws. How can I find out this with Expert Lotto 5 ? It is easy with Excel but just for 1-2-3-5 or even 7 last draws before but it gets really hard for 30 or for 50 or for 100 last draws. How to do it with EL 5? 1. How to create a complex filter to accept only draws which contains 2 to 3 numbers that appeared in the last 3 draws ? 2. Second, how to know if it is the best to be 2 to 3 numbers that appeared in the last 3 draws instead of 3 to 5 numbers that appeared in the last 3 draws ? Or maybe 1 to 3 ? This is the purpose of this tables I shown above. How to create a "between" interval rule ? Let's say I want to create a complex filter to allow all draws which contains between 2 to 5 numbers which have been drawn between 0 to 1 in the last draw ? I try to add occurrence 2 times like in the picture below but it fails to pass more draws in backtesting if I put even larger boundaries. How to do it? This one gives more draws to pass in backtest than the choice to put 0 and 1 to occurrence (same sign for both). Why is that since it should give to me more draws at backtesting because of larger interval boundaries instead of a fewer draws to pass ?